Jessi Fearon lives her Real Life on a Budget- but getting her husband in line when he saw a great sale on Fireworks was still a challenge. Plus her tips on how she got her book buying obsession under control! -Why her husband blew the budget on fireworks! -The benefits of having intentional discussions with anyone with whom you have shared finances. They were having to buy two, get two free. And so he just kept buying stuff, and he said, “I didn't even pay attention when I checked out how much it was”. They looked at the receipt, and his buddy was like, “dude, you seriously spent $700 on fireworks”. You're listening to Financial Grownup with me, certified financial planner, Bobbi Rebell, author of How to be a Financial Grownup. But you know what? Being a grown up is really hard, especially when it comes to money. But it's okay. We're gonna get there together. I'm going to bring you one money story from a financial grownup, one lesson, and then my take on how you can make it your own. We got this. Happy 4th of July, my friends, we have a special just for Independence Day money story. Thanks to our friend Jessi Fearon from Real Life on a Budget. Hopefully you are relaxing and not at work today. If you're joining us for the first time, welcome. Glad to have our returning folks as well, and thank you all for the DMs and the social sharing that's been going on. It's been so fun watching the show continue to gain traction, and we have you guys to thank. So, thank you. Hopefully, like I said, you're getting some time off this holiday week. For mom, Jessi Fearon, who is also an accountant, by the way. She celebrates every 4th of July with her husband, her family, and her friends in Georgia. And her husband is in her words, a total pyro. He loves his fireworks. So much so that he blew the budget, literally, which is not going to fly when your wife runs a blog called Real Life on a Budget. Here is Jessi Fearon. 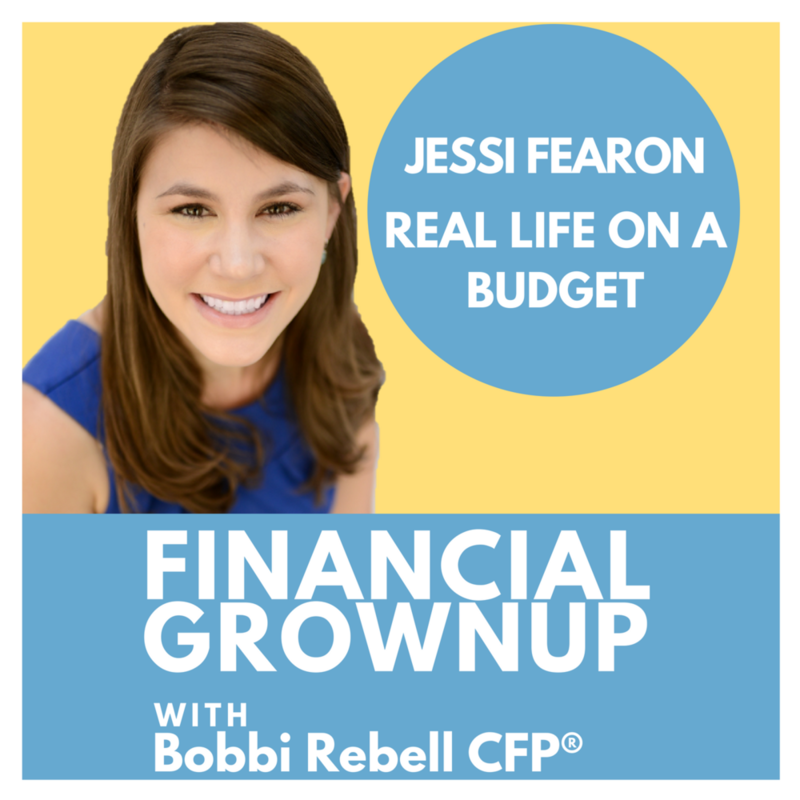 Hey Jessi Fearon, you're a financial grownup. Welcome to the podcast. Well, thank you Bobbi, I appreciate you having me. And I am a huge fan of your blog, Real Life on a Budget, because you get very real. So, congratulations on the success of all that. And you manage it down in Georgia with three kids, which is pretty cool. Yes. Yes. My sweet three children that can drive me crazy sometimes, but are such a blessing at the same time. And not to be forgotten, your husband, who ... This is ... Okay, little bit of trivia here, so your wedding, for fans of your blog, they already know this. Your wedding cost all of $500. But, your husband spent even more, more than ... Your husband spent more than your entire wedding budget on fireworks. So this is an episode that we're going to drop in honor of July 4th. You have the ultimate July 4th money story. Go for it, Jessi. Okay, well, a real quick little just background. It was our first year as a married couple. So we decided that we were going to celebrate the 4th of July with a good old American barbecue. And at the time our state, Georgia. You couldn't buy fireworks in the state of Georgia. You had to go outside the state. And so my husband and his buddies, they load up the truck, and they take the two hour trek over to Alabama. They buy fireworks, and they come back. And I'll never forget it. Me and my girlfriends were watching the truck pull in, and it literally looked like the Clampetts coming down the road. There were so many fireworks in the bed of this truck, it was insane. I mean, I even commented to one of the friends, I was like, "oh my goodness, it looks like they just bought fireworks enough for town hall to shoot off tonight". And so as I'm walking up to the truck, my husband's friends had this look on their face. Oh, oh. Like this guilty look? Yeah. It's like they didn't want to talk to me, they didn't wanna look at me. It was almost like they were afraid they were gonna witness a murder or something, like they just didn't want to talk to me. And I was like, okay. And so I kind of made a joke to one of them. I said, "good mighty, how much did y'all spend"? And the one friend goes, "oh no, it wasn't us". "It was not y'all, it was your husband". What? I look over at my husband, I'm like, "honey, how much did you spend"? And so he starts going to this big deal about how they had this great sale, that it was like, buy two, get two free, and blah blah blah. And I'm like, "okay honey, how much did you spend"? And he was like, "oh, we'll talk about it later". So in my mind I'm thinking, okay, he spent a lot of money. He spent probably like $200. I'm thinking that's an insane amount of money. How could you spent $200 on fireworks, right? So you're guessing he splurged and spent about $200. I cornered my husband and I finally got him to tell me how much she spent. But he spent $702.48 on fireworks. And I literally couldn't believe it. I thought he was joking. I kept looking at him like, what? No you did not. That's our rent money. How could you spend $700 on fireworks? And I was so mad, and so upset, I didn't scream and yell, but it was one of those things where you could just tell that I was really upset about this. I couldn't talk to anybody anymore. I was like, how could you spend $700 on fireworks? Right, and to put that in context too, you do disclose some of your budgeting and your expenses online, but give us a high level, what would $700 buy in the Fearon household in a typical month? That would have bought groceries for about three months at that time, because it was just the two of us. So that would have bought groceries for about three months. That would have paid the one car payment that we had for two months. It would have definitely covered utilities probably for about six months, at the time. And it was in fact our rent money. So it was quite the expense. It definitely was not planned. I really did not think my husband was going to spend that much money. To say that my husband's a pyro is a little bit of an understatement. He likes to blow stuff up. So what happened next? You have this talk. Yes. So the next morning, I remember I was still so mad. I could not believe it. And the thing is, that you can't return fireworks. It's a nonrefundable sale. So, it's not like we could take back any fireworks, because I mean, again, my husband bought so many fireworks, we couldn't even shoot them all off that one night. We had to shoot them off on Labor Day and then on New Year's Day, because there were so many still left. I remember we were cleaning up from the party and we were putting all the fireworks that were left over in the garage. I remember, I was so, so mad, and I kept thinking like, I just wanna scream, I just want to yell. But then the more and more I thought about it, I thought, okay, if I just scream and yell we're not going to get anywhere in this conversation. So why don't I just kind of calm down and take my emotions out of it, and talk to him about this, because I really need to know why he would spend $700. I was raised in a very frugal household, and you don't spend $700 on fireworks. Only people with yachts spend $700 on fireworks. Why would you do this? And so I remember I just kind of turned around to my husband and I was like, "this was a lot of fireworks". And he goes, "it kind of is, isn't it"? "I went a little overboard, didn't I"? And I was like, "yeah honey, you went a little overboard". "So you want to tell me about this because this was a lot of money you spent". This is the first time that I really got to see how, because I'm a saver, my husband's a spender. And so this is first time I got to see how kind of a spender, for him anyways, rationalized his purchase. And it was because of that really awesome sale they were having. They were having to buy two, get two free. And so he just kept buying stuff. And he said, "I didn't even pay attention when I checked out how much it was". He said, it wasn't until we were halfway home that one of his buddies had asked how much did you spend? And they looked at the receipt, and his buddy was like, "dude, you seriously spent $700 on fireworks". And my husband couldn't believe it. He didn't even think it was going to be that much money because he thought he was saving a whole bunch of money. So for us this was the first real money conversation that we actually had as a married couple. We had been married for almost a year. Our anniversary is July 24th. And so we had been married for almost a year at this point, and this is the first time that we really sat down and talked about money, because even though we knew one day we wanted to have kids, or one day we wanted to buy a house, we had no plans for any of that. And so, this situation kind of pushed us into actually having to sit down and have a conversation about money, and we started realizing, okay, if we don't come together and be a team on this, there's going to be more and more $700 expenses on random stuff that isn't important, because he certainly wasn't the only one spending money. He just happened to spend a lot of money at one time, versus where, our day to day lives, we were spending little increments of money here and there, without thinking about it. And I think that it really for us kind of showed us that it compounded on itself to this one big $700 purchase where we went into it with no plan to attack at all. So it was quite the interesting thing. And I forgave my husband, obviously, we've been married now for nine years. So I forgave him, and it's kind of become our epic story for our family, about my husband's $700 expense. So looking back, I guess it's about eight years later. What is the lesson for our listeners? One, if you are married to a spender, always remember to give a grace, because a lot of times spenders don't recognize that they're spending so much money, because they believe that they're saving money because of the sale. And a lot times spenders are really good at finding the bargains. They really are great at that. And just like spenders always get upset with the saver, when they want to save a bunch of money and not spend it. And so for us it came down to finding that balancing act between being a saver and a spender, and having the honest money conversation where we decided together, okay, how much are we going to spend, how much are we going to save? What is the best of both worlds? And it came down to us writing down what our financial goals were, which was saving for a house, paying off debt, and saving an emergency fund. And all of that. So we were able to put those into the budget, but then we were also able to put in spending money for my husband to go and spend money because he still buys fireworks every 4th of July. And he still spends more than probably what most people would. But now it's a planned thing, and he just gets to carry cash. He has to leave the debit card at home, so he can't go crazy in the firework store anymore. So how much cash is he getting this year in 2018? Like I said, it's still more than normal, what most people would spend, but it's $150 that he gets to buy whatever fireworks he wants. So then he can go blow them up all that he wants to. All right. Let's talk about your money tip, because you've gone over budget with things as well. Especially one of your pleasures, which is reading. Yes. Oh my goodness. Yes. And like I said, my husband's definitely not the only one that's at fault. I had spent well over $250 in one year on Amazon buying books. And I kind of didn't even realize it because I think Prime makes it so easy. And so does Kindle, where your just buying books, and you see the deals, and you're like, oh my gosh, I wanted to read that book. So let me get that one. Oh, Amazon suggests this book. Okay. I like that one. But you were actually reading the books? Because sometimes people buy and they don't read. No, I was definitely reading them, because I love, love to read. I read on average of about four book a month, sometimes more, sometimes less. But I just love to read. And here I was just buying all these books and reading, and reading, and getting excited about it. And then when I finally, I usually do, my husband and I will sit down every year and we kind of do a big annual spending review, where we literally look at how much we spent in every single category. And what we spent it on. And when I kinda sat down and realized just how much I had spent in one year on books, I was like, oh. This is my fireworks story, isn't it? I'm like, okay. we got to do something, and so I rediscovered the library. And that has kept me in check this past year so far. So it's been wonderful. I've been able to feed my guilty pleasure without a completely wrecking our budget this time. Love it. All right. Tell us more about what you are up to. I know you've got some new courses on tap. Yes. Right now I have a free five day money challenge. All about things that you can do for the next five days. It's only about 10 minutes, 10 minutes or less a day that you can do right now. These steps that will help you to be able to start managing your money better. It will get you started on the right path to taking control over your money, and to stop letting money control you, and start putting you at the helm of your finances. Excellent. And where can people find out more about you and your blog? They can find me at jessifearon.com, and on Instagram, twitter, and Facebook at Jesse Fearon. I'm constantly on Instagram trying to just share all the little snippets of our real life and all of its imperfect details. Everything for my husband working his side hustle here recently to buy a new boat motor, and our [inaudible 00:12:03] vacation that we go on for the cheap. Awesome. Well, thank you so much and have a great 4th of July. Well, thank you Bobbi. You too. Okay everyone, one thing that Jessi said really resonated when she talked about how a saver, like herself, can better understand a spender, and it has to do with the mindset of the spenders. Financial grownup tip number one. Jessi says, if you're married or in a relationship to a spender, always remember, give them grace. Many spenders are well intentioned, and go off track thinking in that moment when they're making the buying decision, that they're saving money. Seeing a two for one sale sets off a feeling of excitement. So many of us have fallen into buying more of an item than we intended because of the way the seller has priced it. They're smart, they know what they're doing. It sometimes is a better deal. In fact, never once did Jessi criticize the fact that the per firework price of what her husband bought wasn't a deal. He may have gotten good value. He just spent too much. She gets it. And I love her empathy and understanding. By figuring out the mindset of her husband, she was able to steer him on a healthier path and give him the tools. Okay, and also she gave him restricted cash on a budget this year, to resist the next great deal, rather than just screaming at him that he blew the budget. Financial grownup tip number two. Jessi also talks about the fact that this was the very first time the two of them had really sat down and intentionally talked about money. They didn't have kids yet, but they were newlyweds and they had no plan. So if you're in a relationship that involves shared financial resources, maybe have a little chat. If you are not already, please hit that subscribe button, and if you are listening on Apple Podcast or iTunes, please rate the podcast and leave a review. They really matter. Also, if you like the show, just tell a friend to check us out as well. And thanks to Jessi for giving us such a great Independence Day story. Let's all go out and celebrate with our friends and family. Maybe take Jessi's advice, and read a good book. Libraries are great. Also though, it's also nice to buy books on occasion, because we want to support our authors and value what they contribute as well. Authors need to make a living. So, it's a balance. Be sure to check out Real Life on a Budget and Jessi's great free course. I will leave links to both in the show notes. And thank you Jessi for helping us all get one step closer to being Financial Grownups. Financial Grownup with Bobbi Rebell is edited and produced by Steve Stewart, and is a BRK Media production.